On 31 August Kosovo’s president has extended the mandate of the three foreign judges sitting in its constitutional court, whose term in office expired on the same day. Reportedly, the duration of the extension is about two years: until June 2016 (the decision is not published: a notice is available here). Reportedly, this decision was supported by the EU delegation in Kosovo. Those three foreign constitutional judges are a leftover of the semi-protectorate period. When the international supervision of Kosovo ended, in September 2012, its parliament cleaned up the constitution by removing all references to international supervision and its blueprint, the so-called Ahtisaari plan. A transitional provision, however, provided that all officials appointed by Kosovo’s international supervisor, the ICO, “shall continue to carry out their functions in the institution for the specified term of appointment.” This provision (article 161 of the constitution) applied also to the three judges, who had been appointed by the ICO. 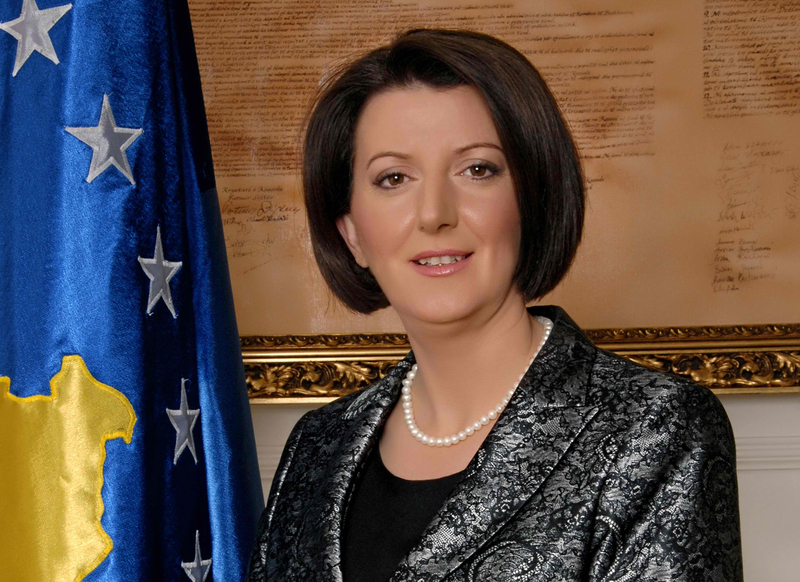 I think that this decision is illegal, based on powers that the president – Ms Atifete Jahjaga, a former senior policewoman who had effectively been elevated to the presidency by the then US ambassador – drew out of her own fantasy. I also think that this decision justifies her impeachment. I regret it shall take a while to explain why. The decision is explicitly based on a recent exchange of letters between Kosovo and the EU concerning the mandate of the EU rule-of-law mission in Kosovo, Eulex. The exchange of letters – available here, as an annex to the law by which Kosovo’s parliament ratified it on 23 April – contains detailed provisions on the appointment of Eulex’s judges and prosecutors, which are explicitly intended to override the provisions written in Kosovo’s laws and constitution concerning the selection of its judicial officials. The exchange of letters does not concern the constitutional court. But there is one reference to its judges: it appears in a paragraph, the seventh one, in which the president “confirms” both the Eulex judges appointed under a previous exchange of letters, and the constitutional judges appointed by the ICO. This, however, can only be read as restating what the parliament had already decided in 2012: namely, that the three foreign constitutional judges would have remained in office “for the specified term of appointment”. In April their mandate had not yet expired, and there is no way to interpret that “confirmation” as an extension of their mandate, or as the basis for a presidential power to subsequently extend their mandate. Plainly, this confirmation is only intended to clarify that the existing Eulex “judges and prosecutors” – who had been appointed through a slightly different procedure than that envisaged by the exchange of letters – shall remain in office. The confirmation, in fact, is followed by a paragraph stating that Eulex – which has no mandate or power to appoint constitutional judges – remains free to replace the existing “judges and prosecutors”, but shall have to do so according to the new procedure. This makes it clear that this confirmation really applies only to Eulex’s judges, not to the constitutional ones, for the simple reason that the exchange of letters contains an appointment procedure that applies to the Eulex judges, not to the constitutional ones. The functional, logical link between confirmation and new procedure is both clear and reiterated, and leaves no room for other interpretations. The reference to the constitutional judges was probably added as an afterthought, to make it (doubly, if unnecessarily) clear that nothing changed for them. There is also a strong systematic argument corroborating this interpretation. As the exchange of letters overrides the constitution, it must be interpreted narrowly, so as to limit the derogation of the constitution to what is strictly necessary to implement it. In the exchange of letters there is no explicit delegation of powers to either Eulex, the EU or the president to select or appoint constitutional judges: there is only a delegation of powers to Eulex concerning the selection of its own judges and prosecutors. So, this exchange or letters cannot be read as derogating from the constitutional rules on the appointment of the constitutional judges. To close the discussion, consider the opposite conclusion. One would have to maintain that, hidden somewhere in the exchange of letters, there is a delegation to the president of the power to appoint three constitutional judges: a delegation without limits, as nothing is explicitly said about it. This would be an astonishing argument, as it would grant to a non-executive and non-directly elected president a power similar to that of the US presidents: given the importance of the constitutional court, such a delegated power would go a long way towards changing the equilibrium of Kosovo’s institutional system. In particular, as an absolute majority is enough to elect a president in Kosovo, a parliamentary majority would be able to appoint government, president and, indirectly, also three constitutional judges. This would seriously weaken the checks and balances system. Can an implied provision in a bureaucratic exchange of letters with the EU do all this? It would be entirely absurd. So we can conclude that the exchange of letters changed nothing on the appointment of the constitutional judges. The applicable provision is article 114 of the constitution, under which the judges – all of them: there is no special requirement to have three foreign judges, and no special rules for foreign judges – are appointed by the president upon a proposal by the parliament, which votes with a two-thirds majority. The president can probably reject the parliament’s proposal, but can certainly make no appointment without it. Hence the president’s decision is entirely illegal: she did something she plainly had no power to do. One might argue that the president merely “extended” the mandate of three existing judges for two years, and did not make an “appointment”. Not so: this is equivalent to making a fresh appointment, because what matters is that the president gave these three jurists the power to act as constitutional judges beyond the duration of their original mandate. After its expiry, those three judges became potential candidates for that post just like all other reputable constitutional experts in Kosovo and the rest of the world. On what basis did she choose them? It was her solitary, arbitrary, non-transparent choice. The constitution does not want that: it wants constitutional judges to be proposed by parliament after a public debate and upon a two-thirds majority vote, which de facto allows the opposition a veto. One might argue that the president did this because Kosovo’s institutions are deadlocked since 8 June, when elections were held. In fact, the parliament has not yet even managed to appoint its speaker, and therefore cannot function (and cannot, by consequence, propose three new constitutional judges). This threatened a parallel deadlock in the court, which by law cannot operate with less than seven judges but would have had only six in office (9 minus 3). The argument is wrong. First, the president herself explicitly invoked the exchange of letters as the basis of her decision, not some implied powers to resolve institutional crises (for the good reason that such powers do not seem to exist). Second, the two-year mandate granted to these judges goes well beyond the purpose of solving that deadlock. Third, even if the extension had been more limited in time, and intended only to overcome the deadlock, the court’s problem was for the court itself to resolve, not for the president. In fact, as the seven-judge quorum is written in a law, not the in constitution, and as the constitution presumably wants the court to be functional at all times, its remaining judges would have been able – for instance – to rule that in such circumstances the quorum must be reduced to five (or four) judges, in order to respect an overriding principle of the constitution. This would have been a more economical solution, as it were, as it does not tinker with the composition of the court, and a solution that does not harm the constitution. The crucial difference is that the three foreign judges are now effectively the president’s judges: just as she appointed them by decree, based on an invented and limitless power, she can also remove them by decree based on the same power (logically, if by discretion she could do something, by discretion she can also undo it). In such an uncertain, unregulated situation, de facto these judges serve at the president’s pleasure and are therefore no longer independent. Thus, there is no doubt that the president breached the constitution. This justifies her impeachment under article 113.6 of the constitution, under which presidents can be removed if they committed a “serious violation of the Constitution”. The violation is “serious” on account of both its nature and its effects. By illegally appointing three constitutional judges, she discredited the presidency, the court, and the very notion of the rule of law. And by placing in the court three persons she arbitrarily chose, she altered the composition of a crucial organ of the state and influenced all its future decisions. In fact, this is one of the most serious violations a president can make. Those who have reason to object to this decision, or who care about the rule of law in Kosovo, can react. Under article 113.6 of the constitution 30 or more deputies can bring this case before – ironically – the constitutional court itself, asking it to remove the president. It would be an interesting case, because the court might be unable to decide it. The court operates with a seven-judge quorum, as we said: but one of the nine current judges has been barred from hearing “political” cases, because he participated to a political rally; and the three foreign ones have a conflict of interest – which by law bars them from taking part in the decision – because the case would concern their own appointment. Each conceivable outcome of this case would be good for Kosovo, however. If the court chooses not to decide it, for the lack of a quorum, political pressure is likely to force the president to cancel her decision. If the court chooses to remove the president, it shall significantly strengthen the rule of law. If, conversely, the court chooses to save the president, as it is more likely, it shall discredit itself even further: this would accelerate the process at the end of which Kosovo will say “enough!”, and will finally give itself an impartial constitutional court. For the last point to be made is that the extension of those three judges is a very bad decision indeed: they approved several indefensible, manifestly mistaken judgements, and did nothing to prevent the court from being captured by Kosovo’s political élite, which now uses it as an instrument for its strategies. So if it is true that the EU delegation supported the president’s decision, it gave her bad advice: so bad that I am reluctant to believe that such advice was in fact given.